Minimal time to fit it all in this week. Minimal experience at hairdressers, but not minimal time unfortunately. Minimal running shoes arrived in post. Yay! Minimal run in minimal shoes, with maximum satisfaction restoring hair to default state! Juneathon day 14 1.58 miles run. Categories: Juneathon, running | Tags: Juneathon, minimalist running shoes, Running | Permalink. F lite 230s. Really comfortable, light and flexible. Might not have enough cushion on road for me but great for BMF and grass parkrun. 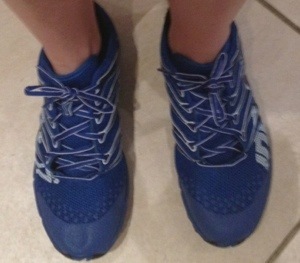 Good shoes, I have road inov-8s but not those. I love mine with a passion. Which road model do you have? I love the flexibility and lightness if them. Road x238, they feel like I could run however I want, not in just one set position. After my Asics I felt there was enough space for a toe party! I agree with the lightness and flex, I look forward to wearing them (which is a bit geeky).